There are several pace calculators out there, but McMillan is arguably the most popular. They claim to be able to predict your race pace based on a time for a different distance. 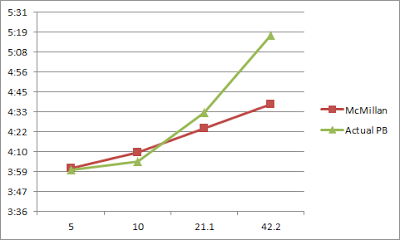 My 10k PB was on a cheater course (net downhill) so that explains why it's a touch faster than the prediction. My 1/2 time is pretty close to the McMillan estimate (and I think I can hit the estimate on the right course!). My marathon time is nowhere close. In fact I don't for a moment think that the pace McMillan predicts is attainable for me... it's just waaaay off. I went out just over 5:00/km at the NYC marathon, and that was about as fast as I dare dream of running over 42.2km. Is McMillan overly optimistic over longer distances? Is the weight penalty a bigger factor as the distances get longer? Or is it just highly personal, and I'm good at pushing through short intense pain but can't hold it together over 42.2? No doubt the predictions are so general to the point of being useless, except perhaps to help you set a reasonable target. All these calculators say that extrapolating a 5k time to a marathon only "works" if you have built up the endurance through training. Based on yesterday's half marathon I can do a 3:12 full (agree), A 41M 10K(agree) and a 19:43 5K (seems too fast). 2) For you - perhaps some yet unrealized capacity for a great result. it is hard to train and finish the Marathon 0:15/K off Half Pace as McMillan would assign. But 0:25/K off Half Pace for a Marathon is very attainable for a recreational Marathoner...especially on a favourable course like Toronto. Mind you these times can be a self-fulfilling prophecy as I will use McMillan to help pace the early parts of races. I'm going to try to narrow the ga on the last two distances above to 4:50/K and 5:00/K this spring. The Toronto Marathon on a downhill course will help. We'll see how it goes. I think you're right... I've always fallen apart in the closing stages of marathons, so the run volume might not have been sufficient vs. my 1/2 prep.